We’re one of Australia’s fastest growing mobility scooter companies because we bring the showroom to you for a free mobility scooter demonstration, and give the lowest prices with the highest quality. Our no obligation, free mobility scooter demonstration at your home happen all day, every day across Brisbane, Gold Coast, Sunshine Coast and Ipswich. We also send scooters throughout Australia via courier. We can always drop by and show you some of our most popular mobility scooters for sale. Up to four scooters can fit into our van! So what happens at a demonstration? Firstly, we talk about your requirements to understand more about where you want to travel. For example, if you live in a hilly suburb, we’ll recommend a larger scooter. Secondly, we’ll give you a training session on how to travel forwards, stop, turn and reverse. This will give you the knowledge and confidence to becoming a proficient driver. Thirdly, we’ll travel around your local area on the mobility scooter. This could be within the village or perhaps down to the local shops. We’ll also show you how to properly maintain a mobility scooter, in particular how to charge the batteries and storing the scooter. There is no obligation to purchase from us, and we encourage customer to shop around to find the right scooter for them. Please look at our buyer’s checklist for more information. 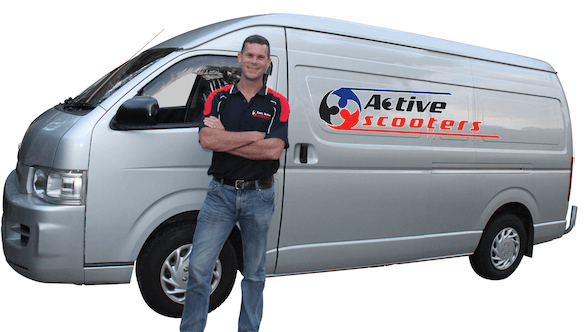 At Active Scooters, we are confident that our scooters are of the highest quality and lowest price, with an outstanding level of customer service. If you’ve been living with limited mobility, call now on 1800 55 48 27 and we’ll come to you for a free mobility scooter demonstration.